Carry comfortably with this hooded jacket featuring 8 total pockets, including 2 interior concealed weapon and 2 magazine pockets. 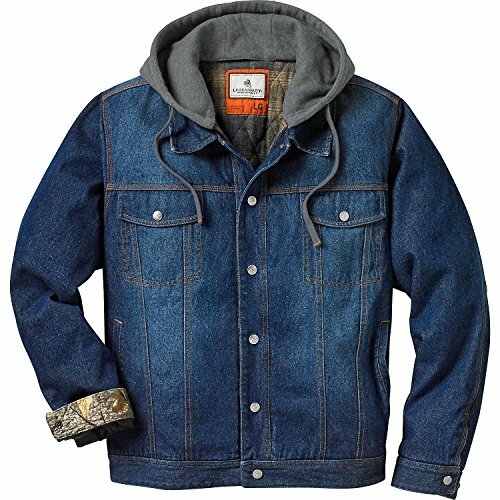 Rugged, sand-washed denim boasts a full-back Signature Buck screen print with metal shank buttons engraved to match and a removable fleece hood with a drawstring. Lining and insulation add warmth and fill out the profile; regular fit with slightly more ease helps avoid weapon detection. Wash: Machine wash cold separately. Do not bleach. Tumble dry low, remove promptly. Low iron if needed. If you have any questions about this product by Legendary Whitetails, contact us by completing and submitting the form below. If you are looking for a specif part number, please include it with your message.